He that will not apply new remedies must expect new evils for time is the greatest innovator. We must do what we conceive to be the right thing and not bother our heads or burden our souls with whether we will be successful. Because if we don’t do the right thing, we will be doing the wrong thing and we will just be a part of the disease and not a part of the cure. The challenge is clear: we have to bring about a positive change in our governance. The major constraint is also very clear: we have to work within the democratic setup. That makes our task harder but not impossible. We have to bring about good governance through participation in the democratic system. The central idea is to use the current system to fix the system. We know that there are powerful vested interests and interest groups. We know that political parties use these groups as “vote banks” and pander to them because it helps the politicians to remain in power and continue to amass wealth at the cost of the larger interests of the nation. We know that the politicians cynically divide the country along religion, caste, and linguistic lines. This fractures the population into very small groups and allows the political parties to win seats with only a small minority of votes in their favor. To counter this, we have to create an artificial vote bank of people who have the capacity to think long-term, desire economic and personal freedoms (not just political freedom), and are willing to work together to bring about change for the public good. Urban educated people will form the core constituency of this vote bank. We call this association of voters the “United Voters of India” or UVI. It’s motto: Good governance through participation. It is likely that a significant percentage of India’s urban educated population are motivated people who have the capacity to understand what good policies are, know the importance of electing capable policymakers, and whose interests are aligned with the broader long-term national interest of India. It is possible that the around 175 urban parliamentary constituencies of India have an aggregate of 30 million or so people who are really interested in good governance. If they can be consolidated into a “vote bank” and persuaded to vote en bloc, it is possible that they can swing elections and be a force to contend with. UVI is a voluntary association. People are invited to join and do so freely and without any coercion. Anyone can join provided they understand the basic principles of the association, and freely agree to abide by the code of conduct of the association. The basic principles are the Pretty Good Principles, mentioned previously. If the government were to make policies consistent with those principles, it would help India’s development. To become a member of UVI, a person first has to understand the PGPs and be persuaded that a system based on them is good. The association will help people understand the importance of the PGPs. Next, the person has to agree to vote in all elections at the local, state, and national levels. Finally, the person has to vote with the association in the sense that the person has to vote for those candidates that the association selects. UVI, as mentioned previously, is a vote bank of urban educated voters. We need this vote bank to counter the baleful effects of other existing vote banks that are based on demographic characteristics such as caste and religion. Like other vote banks, UVI aggregates the preferences of a group of people and thereby it amplifies the demand of the group. In the case of UVI, the demand is better governance. This demand aggregation will therefore force political parties and politicians to supply good governance. For example, if UVI is a sufficiently large vote bank, then it will improve the quality of our elected officials since UVI demands competent and honest politicians. UVI is a national institution but it is implemented at the local level. Every municipal or state assembly and parliamentary constituency will have a chapter. A person is a member the local chapter of UVI. As mentioned before, members of UVI will be required to vote for candidates who are selected by the association. The members of a local chapter collectively decide which candidate to support at the elections. The process is simple. All members of the local chapter are eligible to vote (but may choose to abstain) in an internal election to select which of the candidates running for political office the chapter will vote for in the actual elections. Once the selection of candidates by the local chapter is done, the member of that chapter are honor bound to vote for the selected candidates, regardless of whether they agree or disagree with the choices the chapter has made. What this will do is, first, they will make a difference at the margin. A competent candidate who would otherwise have lost because he or she does not belong to the correct politically powerful group may win if he or she got the support of the local UVI chapter. Of course not all candidates supported by the UVI voters will necessarily win. They will be effective only in cases the win/lose margin is smaller than the number of UVI voters. Second, UVI will be like a “stamp of approval” which others can use to decide which candidates to support. Essentially what UVI does is provide additional information which improves the functioning of the election marketplace – where the sellers are the political parties and the buyers are voters. UVI serves not just voters but also those political parties that are sincere about development. Is UVI a political party? It is not a political party. It is an association of voters. You can think of it as a cooperative. Coops gain bargaining power by aggregating their demand. This is also similar to labor unions in which individuals achieve bargaining power by being part of a larger body. Will UVI be putting up its own candidates? No, it is just a voluntary association of voters. UVI will merely be choosing among the candidates running for office. By aggregating their votes, members of UVI will be forcing political parties to put up better candidates. Our goal is therefore to become the group that all political parties want to get the support of. And with time, if we are successful, then the politicians running the country will not be of the type that can only remain in power by playing the current vote bank politics. Political parties will not be able to ignore UVI voters if the group is significant in size. How much impact can a small number of people have on the outcome of elections? India has 542 parliamentary constituencies with an average of around 1.5 million voters. Of these, there are about 175 urban constituencies. Within each urban parliamentary constituency typically there are seven state assembly constituencies. In each of those there are around seven municipal corporation seats. Voter turnout in 2009 for the Parliamentary elections was about 60%. The average margin of victory in 2009 was about 70,000. To target 30 million voters for the 2014, we need to focus on getting 150,000 members registered for UVI in each of the urban parliamentary constituencies. These UVI members, around 10 percent of the voting population, will be able to swing the elections. Does UVI favor any particular political party? Can people who belong to political parties become members of UVI? Anyone can join UVI but they have to agree to the code of conduct that mandates that the member has to vote in accord with selection that the local chapter of UVI has made. Therefore, a member who belongs to a political party may have a conflict of interest. How will UVI ensure that its members actually vote for the chosen candidate or party? To join UVI, a member has to take a solemn oath to vote with the association. UVI is a voluntary association of people. Therefore, the oath they take is voluntary. So it does not make sense for a person to voluntarily join an association, take an oath, and then betray himself. Why would anyone want to join UVI and thus lose their ability to exercise free choice? That makes UVI non-democratic. UVI actually uses a democratic method of deciding whom to support in any election. The members of the UVI have a “primary” election in which every member can choose to vote. The winner of this primary is naturally a candidate who most closely fits the PGP bill. Only after that is the entire UVI group required to vote for the candidate. This is no different than what happens in the actual election. We all agree to be governed by the government which wins an election — even if we did not vote or we did vote but for the opposition. How will you get your members? There are two avenues for that. First, we will use phones, internet and social networking tools. Second, we will have volunteers who will do door-to-door membership campaigns. Are there any membership dues? Yes, there is a small one-time association membership fee of around Rs 100. This will be used for maintaining the association, for informing the public about what UVI is doing, and for membership drives. So how will they coordinate their activities – regular meetings? Meetings will be up to the local chapters to have or not. Mostly mobile phones and websites will be used. Members’ mobile numbers will be on record. Not everyone in India has a mobile phone and access to the web. How will this work? Our target population is urban and educated. That population does have mobile phones and has access to the web. Will there be positive externalities from the activities of the UVI? Yes, indeed. We are all busy people. Some of us, however, spend more time than others in informing ourselves. These people will help the local chapter select the candidates to support. This information will be easily available to both members and non-members of UVI. Therefore people will be able to “free-ride” on the work of others who do due diligence on which candidates to support. Candidates who get the “UVI stamp of approval” will get the votes of people who are interested in good governance but are too busy to work it out themselves. What makes you think that this will work? If it’s such a great idea, why has it not been tried before? We don’t really know what will work until we try. It is worth a try since our future, and the future of our next generations, depends on what we do. It has not been tried before but then if there was nothing new under the sun, it would be a pretty dismal world. Whatever you do, or dream you can, begin it. Boldness has genius, power, and magic in it. India is not a developed country. It should have been but it is not. India is not destined to be a poor, underdeveloped, so-called “Third World” nation. There is no divine compulsion about it. All the necessary ingredients for India to be a prosperous nation exist. India has adequate natural resources. Granted that it does not have an over abundance of them but neither has nature been exceptionally unkind to India. India has human resources – indeed it has a super abundance of raw human resources. Indians are not particularly stupid as a collective, either. By all measures, they are fairly close to average in intelligence and motivation, and in their desire to live and let live. India does not suffer from periodic widespread natural disasters which destroy any accumulated capital, leaving death and destruction in their wake. So what accounts for the singular failure of India to develop? My contention is that India’s failure can be adequately explained as a failure of the governments India has had the misfortune to have. I am convinced that bad governance lies at the root of India’s troubles. Put simply, the government has not been doing its job. Consider this fact. Indians do quite well outside India. In the US and other developed countries, they are extraordinarily successful. Their ability to prosper outside India is in sharp contrast to the inability of their counterparts within India to prosper. That means that it is not nature but rather something in the Indian environment which accounts for Indians not prospering in India. And that environment, we must remember, is created by the government. I should acknowledge a simple point at this juncture. The government of a country, especially one which is a democracy, is a creation of the people and therefore has to be a reflection of the collective character and will of the people. Therefore the blame for India’s unspeakable governments must belong to Indians as a whole. As they say, a country deserves the government it gets. But let’s set aside that point for now and move on. The sole objective of a government has to be to provide governance. Its primary role is the creation of social capital, to be a guarantor of civil rights, to maintain law and order, to correct for externalities, and to create an environment where individuals and corporations have the freedom to create wealth. The government has to be an enabler in the process of wealth generation, not an inhibitor that it has been for so long. The role of the government is to set the rules, not play in the great economic game. We have noted it before but it is worth repeating what Douglas North observed, that “economic history is overwhelmingly a story of economies that failed to produce a set of economic rules of the game (with enforcement) that induce sustained economic growth.” It is a cautionary observation and clearly underlines what lies at the root of India’s failure to develop: the government has abdicated its primary function of designing the rules and enforcing them fairly but instead entered the game as a player. The results of the government’s involvement in, and stifling control of, the production of goods and services rather than in rule-making and law enforcement are plain to see. Just to take a very critical example, consider the generation, transmission, and distribution of electrical power—the life-blood of a healthy economy. Public sector power corporations have let us down. Power shortage is a crisis for consumers, but even more for industries, the producers of wealth. It raises production costs and our manufacturers are handicapped in the competitive global marketplace. In an era of globalization and international competition, Indian corporations face challenges that are mainly derived from government interference and control. Indian industry also faces an acute shortage of trained human resources. It is regrettable that only about a quarter of Indian college graduates are employable—a sure sign of a failed education system. Once again, this is a direct consequence of needless government prohibition of the private sector investing in education. The government’s near-monopoly control of education has crippled it. The results are as expected: poor quality, extreme shortages, and high costs. India cannot afford the handicap of a massive uneducated population. The production of goods and services – including education – is not the job of the government; that is the job of the private sector. By getting into production – too often as a monopolist – the government has demonstrated its abject failure. This failure is expected and cannot be otherwise because governments are not capable of inventiveness, entrepreneurship and innovation. Those are qualities that it cannot have and thus cannot compete in the marketplace. By wasting its energies on activities that it has no comparative or competitive advantages in, the government has neglected what it is required to do: design the rules and enforce them, and create the environment where contracts can be made and enforced. That failure is as costly – if not more – than the failed attempts by the government to produce goods and services efficiently and in sufficient quantities. Consider the functioning of our legal system, as an example. Among the institutions of governance are the legislature, the executive (including the bureaucracy) and most importantly the judiciary. The statistics of the inadequacy of the judicial system are staggering. There is an estimated over 20,000 cases pending in the Supreme Court, around 3 million in the high courts, and a mind-numbing 22 million cases in the rest of the legal system. There are cases in the high courts which date back to the 1950s. Aside from the deep concern that justice delayed is tantamount to justice denied, the backlog of cases has serious detrimental effects on the business sector in India. When contracts cannot be enforced, the economy loses from potential trades that do not take place. The limited liberalization of the economy from some of the shackles of socialistic control has given us an economy growing at a respectable rate of 7 to 9 percent annually. But unless the governance of the economy is improved, even further liberalization – which is sorely needed – will be insufficient to sustain growth. And if growth is not sustained, the hundreds of millions of people trapped for so long in poverty will not have a reasonable shot at economic emancipation. 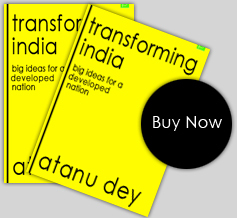 In this book, I have attempted to address these questions: why India is poor, why it is not developed, what should we do to make India developed, what can we do to bring about the transformation of India. I am reminded of what Robert Lucas, Nobel prize-winning economist, said: "The consequences for human welfare involved in questions like these are simply staggering: Once one starts to think about them it is hard to think of anything else." If the argument that the government lies at the root of India’s problems is correct, then to solve India’s problems requires that we change the government’s objectives and thereby change the outcome. The current objective of the government – extract and exploit – was inherited from the British. Until that changes, India will suffer from poverty and underdevelopment. The best available avenue open to us is political. We have to use our collective power to elect good people to positions of responsibility. In economic activities the greatest of virtues is religion to be tolerant and, in its own curious way, permissive. Under the socialist regime of Jawaharlal Nehru and his family successors the state was intolerant, restrictive and grotesquely bureaucratic. That has largely changed (though much bureaucracy remains), and the natural tolerance of the Hindu mind-set has replaced quasi-Marxist rigidity. When left to themselves, Indians (like the Chinese) always prosper as a community. Take the case of Uganda’s Indian population, which was expelled by the horrific dictator Idi Amin and received into the tolerant society of Britain. There are now more millionaires in this group than in any other recent immigrant community in Britain. They are a striking example of how far hard work, strong family bonds and a devotion to education can carry a people who have been stripped of all their worldly assets. The transformation of India is not going to be easy but it is not going to be impossible either. India needs that transformation urgently. A couple of generations of people – our parents and grandparents – have suffered India’s disastrous descent into Nehruvian socialism. We stand at a possible inflection point. Our actions will determine if our children will suffer the same fate as our parents. India’s transformation into a truly free country is the challenge. If we don’t take up that task, then who? And if not now, then when? Please visit http://atanudey.com/TransformingIndia for providing feedback, and joining the discussions. This book is available in both hard and soft copy formats, and through various channels. Details are at the website.